Elipson is France’s oldest speaker brand. Founded in 1938, it ran as an independent company until 2008 and during that time never exported its products. Which says a lot for the strength and patriotism of the French market. It is now part of the AV Industry group, a company with rather more ambitious ideas about potential markets, hence the appearance of the Facet line and other ranges on these shores. Elipson’s classic speakers were nearly always curved, either spherical or ovoid, and there is one tribute model (BS 50 with its upward firing drivers and reflector) and two derivatives (the spherical Planet models) of that style in the current range. But the wider market has always been a little shy of curvy loudspeakers so the Prestige Facet range consists of box loudspeakers and the 24F is the largest of these. It’s certainly substantial at over 26 kilos and a 1137mm height – nearly four feet in old money. 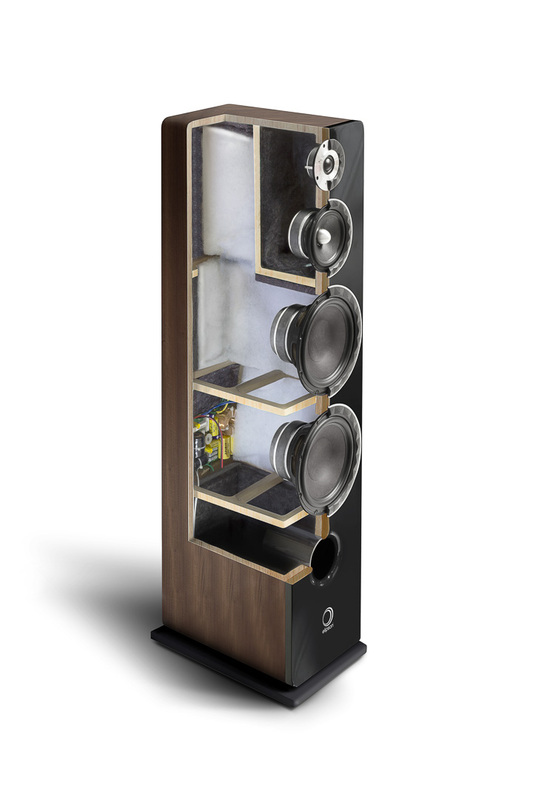 In many respects it looks like a classic ‘mug’s eyeful’ loudspeaker; with its multiple large drive units in funky surrounds on a shiny baffle, it could be considered a bit brash in terms of styling and better suited to tastes outside western Europe. But don’t let that distract from the fact that it’s an awful lot of loudspeaker for the money – too much to have been manufactured in France, of course, but that’s where it was engineered, and that’s what counts. Those bass drivers are 200mm types, bigger than you see on many speakers these days and this plus the decent size of the box means that sensitivity is a useful 93dB; this is measured at 6Ω (so closer to 91dB in real terms) but still very useful if you want to produce a decent sound level without too much effort. The Facet 24 is a three-and-a-half way, so one of the bass drivers is helping out with the midrange as well; you wouldn’t have thought the 165mm mid driver would need it, but that is where most of the action is so it probably doesn’t hurt. Both drivers are polypropylene designs and have an unusual corrugated trim beyond the suspension. This presumably is the source of the Facet name and is said to “reduce the baffle effect and limit diffractions”. The tweeter has the same facet surround and a short horn on the soft dome driver. When I visited Elipson in 2018, it put on three demonstrations, two of which were in home cinema set-ups. One was typical of the genre, loud and with too much bass (that was with a retailer), but the second was remarkably refined and transparent with the levels set below the pain threshold. Both systems featured similar speakers but the second, by Dolby, involved a high end processor. Essentially this proves that source is king whatever the style of material. It also reveals that Elipson has more than half an eye on the home cinema market, which is rather bigger in France than it is here. This probably explains the high power handling nature of the Facet 24F with its high sensitivity and large bass drivers; the big bore front firing port also augments the bass of course. The cabinet has a vinyl wrap behind the shiny baffle and curved corners for a contemporary feel. It comes with an optional flat base to increase the footprint and comply with ‘topple test’ regulations but I’m surprised it needs one as the box is hardly skinny. Cable connections are via bi-wire terminals sensibly placed near the bottom at the back.